THANK YOU to our Fargo Table Sponsors - Dakota Medical Foundation/Impact Foundation, Eide Bailly LLP, Hotel Donaldson, Mosaic Foods/Mezzaluna, Plains Art Museum and Roers! Andrea Larson’s broadcasting career has taken her all over North Dakota. She has had opportunities to track lawmakers as a Political Reporter in Bismarck, and chase convicted criminals across the country on a crime beat in Fargo. Andrea has garnered dozens of awards along the way. She is thrilled to now be co-hosting a morning Lifestyle show called *North Dakota Today* on KVLY-TV. She also anchors the 5:30 evening newscast on KXJB-TV. 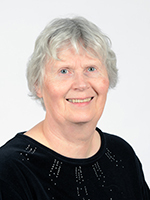 Dr. H. Elaine Lindgren, professor emeritus and author, was a member of the North Dakota State University faculty from 1970 until her retirement in 2005 from the Department of Sociology and Anthropology. She received her Ph.D. from the University of Missouri and her research interests include social change, gender and citizen participation. 2001 Editor's Award for the most outstanding contribution to North Dakota History in the year 2000 for "Coal, Cuba, and Courage: The Adventuresome Spirit of Annie C. Lind." Vol. 67, No. 2. Elaine currently serves on the board for Theatre B and as a volunteer for the Fargo Emergency Food Pantry and the Spirit Room. She and her husband, Jon, make their home in Fargo where he is a former mayor. Dr. Mathison is a double-board certified physician, the founder of the Catalyst Medical Center and an expert on health, beauty, wellbeing, social entrepreneurship and the future of medicine. Her blog and weekly newspaper column have earned her 30,000+ readers and social media fans locally and around the world. Dr. Mathison champions women physicians as a coach and consultant, reflecting what’s possible for “modern medicine women” by leveraging technology and innovative business models to serve patients in new ways. She has served on numerous non-profit boards, including Dakota Medical Foundation, Impact Foundation, Plains Art Museum, Ronald McDonald House and United Way Women’s Leadership Council. She organized TEDxFargoWomen, the local TEDMED Livecast, and is on the executive committee for TEDxFargo and North Dakota Women’s StartUp Weekend. She’s a Stanford University graduate who earned her medical degree from the University of Texas-Southwestern Medical School in Dallas, followed by seven years of specialty training at the University of Washington-Seattle. She’s received numerous accolades for her community leadership and Top Doctor for her clinical skills. Her medical center has been recognized as The Best Cosmetic/Esthetic Clinic in the region by Forum Readers. She currently resides in Fargo with her farmer/broker/auctioneer husband, Steve, and 6-year-old son Grant. 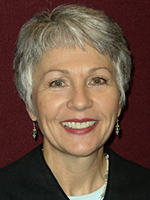 Karen K. Klein, U.S. Magistrate Judge for the District of North Dakota, has served in that position since 1985. In 2005 she was named as Chief Magistrate Judge for the district. Her primary duties involve civil case management, mediation, civil trials and preliminary criminal proceedings. Judge Klein was raised on a farm near Minot, North Dakota, and received a B.S. degree from Minot State College. She received her J.D. degree from the University of North Dakota, with distinction in 1977, and during law school served as Editor-in-Chief of the North Dakota Law Review. Prior to her judicial appointment, she was a law clerk for U.S. District Judge Paul Benson in Fargo, and then practiced law in Fargo for several years. Judge Klein presently serves as a member of the U.S. Judicial Conference Information and Technology Committee and formerly served on the U.S. Judicial Conference Committee on the Administration of the Magistrate Judges System. 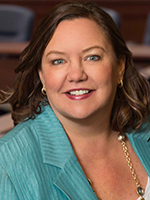 She recently completed a term on the Board of the Federal Judicial Center and formerly served as Chair of the Federal Judicial Center’s Magistrate Judge Education Committee, through which she participated in planning and presenting judicial education programs. Judge Klein has also served as an international judicial education consultant and faculty member for judicial education workshops and reform efforts in about a dozen countries in the Middle East, Asia and Eastern Europe. Judge Klein is a Past President of the Federal Magistrate Judges Association. She has a grown son and daughter, who both live in Fargo, and two years ago adopted an adorable Maltese-Shi Tzu named Pal, who truly lives up to his name. Colonel Wilz is currently assigned as the Chief of Staff for the North Dakota Army National Guard. A native of Richardton, ND, she began her military career in November of 1983 as a Military Police Officer with the 191st MP Company, Mandan, ND. She was commissioned as a Second Lieutenant in 1986, and has since served in various leadership positions to include Platoon Leader, Detachment Commander, Company Commander, Operations Officer Executive Officer, Battalion Commander, Brigade Operations Officer and Brigade Commander. 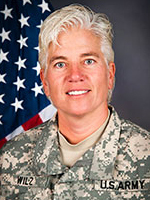 Prior to her current assignment, Colonel Wilz has held a variety of full-time positions within the Army National Guard. Her positions include: Counter Drug Operations, Drug Demand Reduction Officer, Equal Opportunity and Labor Relations Specialist, Officer in Charge of the 164th Combat Engineer Battalion, Counterdrug Coordinator, Director of Military Support/ Deputy J3, G3 (Operations Officer) for 141st Maneuver Enhancement Brigades deployment to Kosovo, and the Deputy Chief of Staff for Operations for the NDARNG. Colonel Wilz has received several awards including the Meritorious Service Medal, the Army Commendation Medal, the Army Achievement Medal, the Army Reserve Component Achievement Medal, the National Defense Service Medal, the Armed Forces Reserve Medal, the Southwest Asia Service Medal, the Kosovo Service Medal, the NATO Medal, the Humanitarian Service Medal, the Defense of Saudi Arabia Medal, the Liberation and Defense of Kuwait Medal, the North Dakota National Guard Meritorious Service Ribbon, the North Dakota National Guard Commendation Ribbon and the Meritorious Unit Citation. Colonel Wilz graduated from Dickinson State University in 1990 with a Bachelors of Science in Education and holds a Masters Degree in Strategic Studies from the United States Army War College. 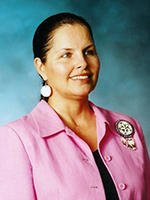 Cynthia A. Lindquist earned a Liberal Arts Bachelor’s degree in Indian Studies and English at the University of North Dakota in 1981 and a Master’s degree in public administration (Indian health systems emphasis) at the University of South Dakota in 1988. As a Bush Foundation Leadership Fellow, Dr. Lindquist earned a PhD in educational leadership at the University of North Dakota, May 2006. She began responsibilities as President of Cankdeska Cikana (Little Hoop) Community College in October 2003, which serves the Spirit Lake Dakota community and is her home reservation. Dr. Lindquist is an adjunct faculty member, Community Medicine & Rural Health, with the University of North Dakota School of Medicine & Health Sciences. She is a founding member of the National Indian Women’s Health Resource Center, a non-profit advocacy organization. Dr. Lindquist served as member of the Council of Public Representatives (COPR), an advisory council to the Director of the National Institutes of Health (NIH) and is a former Executive Director, North Dakota Indian Affairs Commission. Dr. Lindquist was recently elected as Board Chair for the American Indian Higher Education Consortium (AIHEC) the non-profit advocacy organization for the thirty-seven tribal colleges and universities. She is a member of the Board of Trustees for the American Indian College Fund which is the scholarship fund raising organization for the tribal colleges and universities. Dr. Lindquist also serves on the Board of Trustees for the Higher Learning Commission, North Central Association of Colleges and Schools.